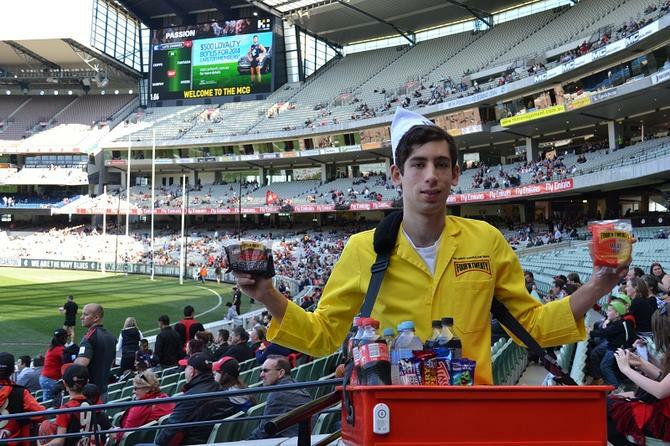 One of the pie boys offering free pies to Melbourne Cricket Ground patrons during the iBeacon trial. Photo credit: Melbourne Cricket Club. The Melbourne Cricket Ground (MCG) is conducting a Beacon trial during September where Australian Football League (AFL) fans who have downloaded a pass to their Android or iPhone smart phone will receive a free Four `N Twenty pie. Staff will be equipped with Beacons that trigger location-specific messages via Bluetooth to patrons’ smart phones as they move around the stadium during AFL matches. Patrons who spot the pie touts and present their notification message will receive a free pie. There will be 50 pies given away at each AFL match. However, footy fans who aren’t at the MCG can still download the pass and go into a draw to win a year’s supply of Four ‘N Twenty pies. A Melbourne Cricket Club (MCC) spokesperson told CMO Australia that it is exploring the use of Beacons as a way to engage fans at the stadium while plans for an upgraded Wi-Fi network and improved 3G/4G phone coverage are finalised. “We currently have a Wi-Fi network but we’re looking to upgrade it so that it can manage the demand for connectivity in a stadium of our capacity. We expect to be in a position to provide full details about our plans for a range of stadium improvements at the end of October 2014,” the spokesperson said. In a statement, MCC customer engagement executive manager Ben McAuliffe, said that it is investigating a “range of enhancements” for fans. “We understand that the fans have expectations when it comes to connectivity and engagement at the MCG and we’re keen to test how Beacons can contribute to making the MCG experience as easy and enjoyable as possible,” he said.